'Whispering Pines', the Francis Draz estate in Far Rockaway. Draz was the president of Francis Draz & Company, wine merchants. Click HERE to see a picture from Shorpy of a Francis Draz & Co. store from 1906. If anyone has any additional information on the house please share. 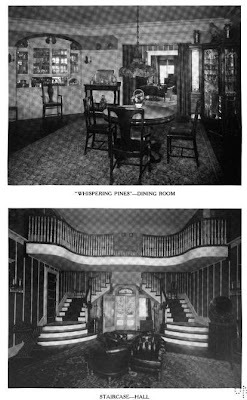 Photos from American Country Houses of Today, 1917. 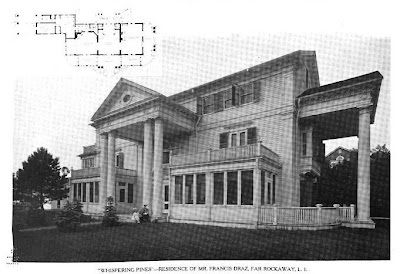 I notice no architect is credited for this house & wonder if Francis Draz didn’t design it himself after sampling a wine shipment. It looks like they took a big, square block of a house & stuck various attachments on like a ‘Mr. Potato Head' (obviously my opinion). The floor plan isn’t that impressive & the stairs look like someone is about to stage a production of 'Showboat.' The dining room is … okay (is ‘MEH’ the correct term?). Zach, if you find additional information on this house I hope it includes a major remodel. Not sure how I feel about the exterior, but I rather like the staircase. There's a boarded-up building on Point Breeze Place to the northeast of its intersection with Mott Ave which *might* be an old carriage house associated with Whispering Pines. It can be seen via Google street view. Here's a link to a story about that building. It doesn't say anything about when it was built, just that it was later known as "Sunset Lodge." Sad,sad story.I've always associated Far Rockaway with junkies and hookers...I'm surprised to find it was at one time a major estate area. Boy Doug, you sure hit the nail on the head ––– Showboat is the very first thing that sprang to mind when I saw that staircase; followed shortly thereafter by a quote from The Women, when the character Edith Potter opines, "I hate this dress; my husband always says I look as if I'm about to sing in it." The Rockaways have always been NYC's poor stepchild; having a year round, unimpeded ocean view does not make up for being under the direct flightpath of JFK. Security word - gogstict: wound accidentally inflicted during a frog gigging marathon. that would meet to visit ruins or public mansions....but I don't think anyone that visits here is intrested...though it would be nice, I could use some kindred spirits at this time......" No one that visit this site would be interested??? Come on! I believe the gentlemen's name was Warren. His website has sort of fallen of the radar since OLI came around. The forum was not as active as OLI but it was the first. 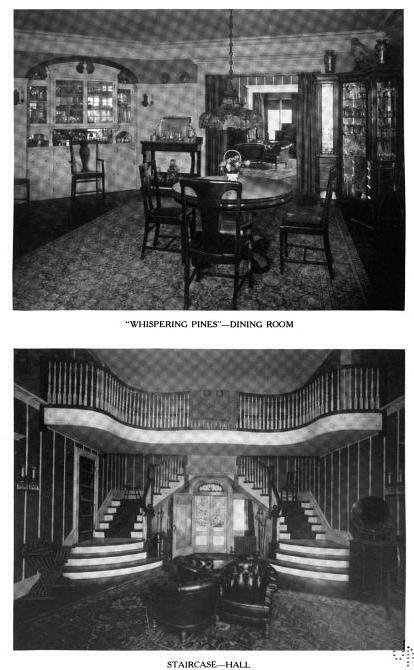 The design of Whispering Pines has been credited to architect Stanford White, but I believe it's actually the work of Stanford's mentally challenged, younger brother, Arizona State White. Another White-attributed design that most probably isn't; if the man did as many houses as he was purported to, he'd still be chained to his drafting table, churning out clapboard monstrosities...he may have had some clunkers, but I can't believe this is one of them. But seriously, I wouldn't say no to meeting some like minded "Island Boys" (and girls) as it were; Long Island has such a rich architectural & social history. Here's a Bing view of the intersection of Mott Ave and Point Breeze Place in Far Rockaway: http://www.bing.com/maps/?v=2&cp=qs1sbr8vk756&lvl=19.18660038828173&dir=0.4437141737074968&sty=b&where1=Mott%20Ave%20%26%20Point%20Breeze%20Pl%2C%20Far%20Rockaway%2C%20NY%2011691&q=Mott%20Avenue%20and%20Point%20Breeze%20Place%2C%20Far%20Rockaway%2C%20New%20York&form=LMLTCC You can see the house Ancient referred to in the northeast corner. You guys enjoy yourselves if you group up to go on historic home tours – remember, there is nothing on those estates that needs your initials carved in it (joke). I looked at HPHS’s link to Historic Aerials of when ‘Breezy Point’ was still standing (thank you HPHS) & then went to Bing & was a little surprised to find you can still see part of the footprint of the demolished mansion: http://www.bing.com/maps/?v=2&cp=qs1ttb8vk0zr&lvl=19.206779159478568&dir=0.44371172009954607&sty=b&where1=Mott%20Ave%20%26%20Point%20Breeze%20Pl%2C%20Far%20Rockaway%2C%20NY%2011691&q=Mott%20Ave%20%26%20Point%20Breeze%20Pl%2C%20Far%20Rockaway%2C%20NY%2011691&form=LMLTCC (especially if you rotate the angle to when the grass is green). ‘Breezy Point’ must have been a good name for it – it must have once been great to spend your summers there. Not the "Whispering Pines" gatehouse but a summer hotel. However Whispering Pines was its neighbor standing at the corner of Mott and Breezy Point Place. Highlight the old photo - you can compare the window seen in the background to the Google Street View - the same! HistoricMapWorks confirms.